Although many bloggers prefer not to disclose their income, I thought that if I ever decided to share an income report that it would be during the earlier years of my blog, where growth tends to be more prominent (and less flashy). I know that many of my readers are not interested in blogging nor have plans to make their own, so I completely understand if you decide to skip over reading these kinds of posts. However, I’ve also received many questions if whether or not I think blogging is a legitimate money-making job and that’s why I’m choosing to publicly share my income. The intention of this income report is not to brag, but to reflect on my 2nd year of blogging, form a strategy for the year of 2019, and more than anything, to show others that it is very possible to make a living by blogging. I definitely did not make anywhere near 6-figures, but I think that my effort these past 2 years paid off, and I’m excited to see what’s in store for me in 2019! Before I dive into the year of 2018, I want to share a bit of background and also touch on my previous year of blogging to give you more perspective. No two bloggers are alike, so you can’t quantify their “success” by comparing them. It’s easy to read income reports from various bloggers and expect to make x amount of money, but you should keep an unbiased perspective since we are all in completely different niches, and some bloggers may be further ahead in their journeys than others. So do not compare yourself to other bloggers! I work completely by myself. I do not outsource any of my work to a virtual assistant, personal assistant, or anyone else for that matter. 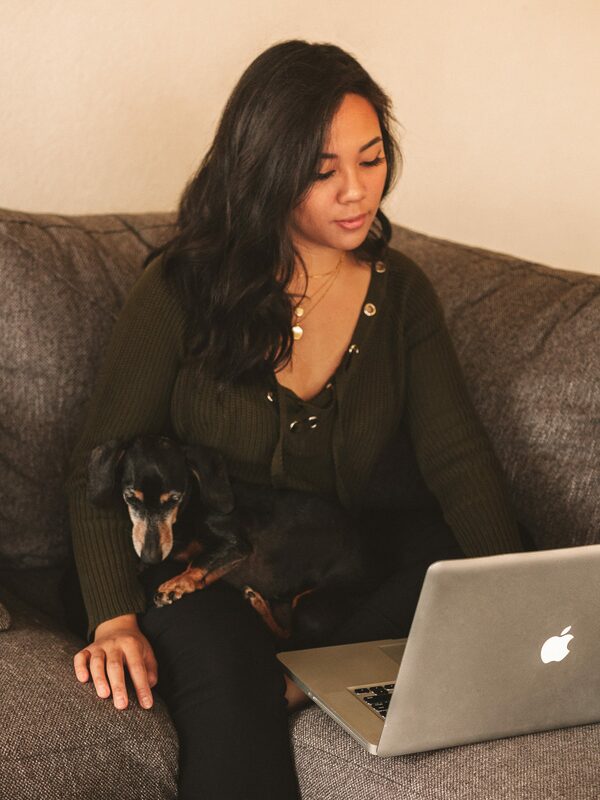 Having extra help can definitely give you a leg-up, but I prefer total control over my business and since I’ve only been doing this for 2 years, I wanted to be sure I knew what I was doing before even considering an intern or paid assistant. Some of my outfit photos for my Instagram were taken by my boyfriend Jun using my camera, but I planned, directed, styled and edited every single photo. This year, I focused half my efforts on my Instagram content and half on blog content. There are many bloggers who use Instagram leisurely and focus the majority of their efforts on their blog, but I did both. For the majority of 2018, I posted at least once per day on Instagram followed by multiple stories and engaging with my followers, which took hours out of my day. For my blog I strived to publish at least 4 posts per month and focus on SEO and Pinterest for promoting my blog. In hindsight, I honestly think that if I focused mostly on my blog I may have made more income. I do not have another job. I started my blog in October of 2016, smack-dab in the beginning of Q4 after I was laid off from the car dealership and also after quitting my other job as a Realtor. I took a huge leap of faith and pursued blogging full-time. So of course, my results would have been vastly different if I was doing this only part-time or had a full-time job to juggle. While 2018 yielded the beginning of a substantial income, the previous years were integral in getting the ball rolling. In my 3 months of 2016 (October – December when I first started), I made a grand total of $72.02. I was only on the Amazon Associates affiliate program at the time, and because my earnings were below $100 I wasn’t even able to cash-out this payment. I finally redeemed it in January of 2017 when I reached the $100 minimum payment threshold. 2017 was my first full year of blogging, and I made $10,727.91. Although I was operating for an entire calendar year, I was still in my start-up phase, which also meant I was working long hours and not yet seeing a return on my invested time and effort. I had to exercise a lot of patience during this year and create a very concise budgeting plan to prevent financial struggle. A lot of those budgeting posts can be found in my Budgeting section. For the first few months of 2017, I only made a mere few hundred dollars. The majority of my income was from Amazon Associates because 1) my site traffic and social media followings were too small to make a substantial income and 2) Amazon carries everything, so I thought it was best to focus my affiliate efforts on this single affiliate program. Then between May to June, a spike in income occurred. During this time I focused on growing my email subscriber list (which currently has over 8,000 subscribers) and promoting my posts on Pinterest. I finally began seeing a return on my invested time: moving forward, there were big jumps in monthly income. During my first month of 2017 I made $267.02 and in my last month I made $1,569.09, which means my monthly income grew by 487%! Not bad for my first year. For the year of 2018, I focused on 3 things: 1) growing my site traffic and social media followings, 2) committing to publishing new content regularly, and 3) diversifying my income. I admit that I overworked myself this year yet again (probably more than the previous year), as I spent most of it being stressed and burnt out. 2018 was a process of figuring out a healthy work/life balance and learning my limits. Throughout the year I encountered many obstacles both work-related and in my personal life, so my month-to-month income was inconsistent as a result. I also struggled with streamlining my day-to-day work routine: some months I’d focus more on sponsored posts and others I’d focus on affiliate marketing. For example, in May I earned more money than I did during the following month of June, but in June I made more affiliate and ad income than I did previously in May. For the first half of the year I was doing a lot of free sponsored work, and if I was paid, I was definitely not charging the rate I should have been. I regret both moves. The major changes in Instagram’s algorithm also affected how much I could justify charging for my decrease in engagement and growth, so in order to maintain my increase in sponsored income I felt that I needed to work twice as hard for sponsored posts. During the last half of the year, I decided it was best to do less sponsored work and increase my rates. At first, my sponsored income tanked but later picked back up again. It even broke new highs thanks to no longer under-selling myself! Prior to October I was doing at least 5 sponsored posts per month and was feeling uninspired, extremely pressured and worried that my audiences would be turned off by the frequency of sponsored posts. I think this was the best choice ultimately because it forced me to focus on other income avenues and create better-quality sponsored posts that were also more tightly-focused on my niche. In the middle of 2018, I learned my lesson that accepting free products as payment wasn’t worth it anymore, so I 1) stopped promoting items that I was not 200% obsessed with, and 2) stopped promoting brands that did not give me an opportunity to earn from affiliate sales. However, I still made some exceptions (and still do, in fact). Here’s why: the brands I chose to work with despite being unpaid still had a competitive and rewarding affiliate program in which I could get a commission off each sale I made – thus, there was an opportunity to earn passive income. And while at first this may not sound like a lot, but many if not all of the blog posts I’ve written in exchange for free products now earn me a few hundred dollars each month. So in this respect, my sponsored income may not have grown, but my affiliate income surely did. During late 2017 I switched my ad network from Google AdSense to Mediavine, which is a higher-paying ad network. As expected, my earnings with Mediavine started quite low, but over time they increased. I focused on building my site traffic through the power of good SEO practices and promoting my posts on Pinterest, which helped drive a ton of traffic to my little blog. This income stream is often overlooked by most beauty and fashion bloggers because it seems that the more popular income streams are sponsored posts followed by affiliate links; however, if you want more passive income I highly suggest to focus less on sponsored work and more on increasing your site traffic. Read How I Got 3 Million Monthly Views On Pinterest to see my tricks for the exact steps I took. 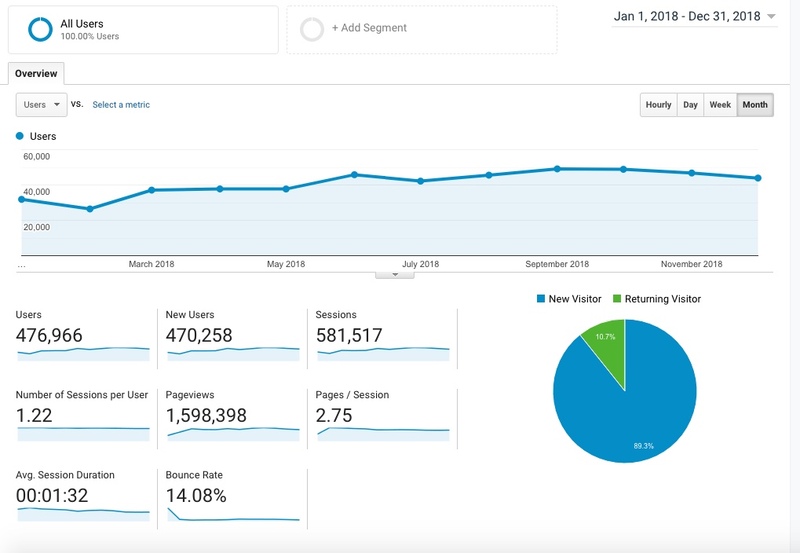 The above Google Analytics report shows steady growth throughout the year. While I didn’t “explode” in growth like many bloggers claim to, my growth was consistent. Some months seemed to plateau or even decline over the next month, but the following month would usually pick back up. While there was normal growth in users and sessions, you can see that my pageviews more than doubled. This year I wrote many more blog posts, which led to more “doorways” into my blog through Google searches, Pinterest and Instagram sharing. Another thing I did: at the beginning, middle and end of each blog post I linked related posts to keep users hopping around my site. It takes a bit of time to go through all your old posts and “daisy chain” them, but I highly recommend doing it as it helps tremendously. In July and August I took on a temporary marketing project for a friend’s start-up company, but concluded by the end of the first week that splitting my focus between 2 different businesses was too much for me to handle – in fact, my sponsored income suffered at $0 during one point because I simply had no time for it. While the extra money from freelancing definitely made for a nice pay raise those 2 months, this project took many hours of my valuable time and added tons of unnecessary stress to my plate. This experience taught me to be a bit more cautious and thoughtful about future side projects as they may take more effort and energy than I have to offer. 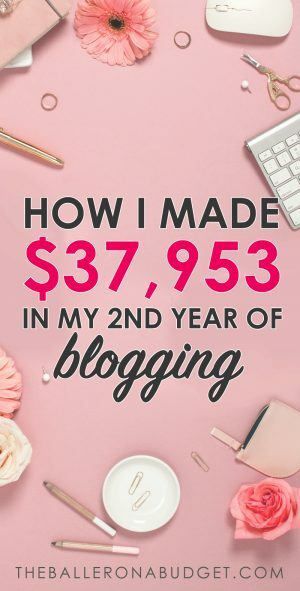 In 2018, I made $2,679.22 in The Blogger Bible course enrollments, which means that I actually wound up making a total of $35,273.95 excluding those sales. 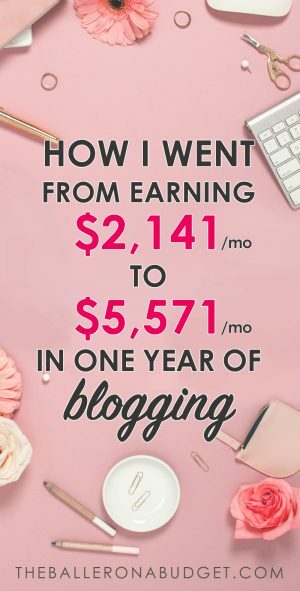 I think it’s extremely important to be transparent about this because many higher-earning blogging income reports online don’t emphasize that a large portion of their earnings were from “how to blog” products, books or courses. Not everyone wants to blog about how to blog, so it can definitely make new bloggers feel pressured to create their own blogging product at some point in order to make a similar income. This is not true! Creating blogging products is just another avenue of income and a way to help those who want to know how they can achieve positive results with their own blog. However, it is not mandatory to create a flourishing full-time income. As you can see, my course income was just a tiny sliver of my total yearly earnings as a whole. The Blogger Bible didn’t have a massive amount of enrollments upon launch, and if I’m being honest, this was probably because I did not promote it enough. I focused more on other sources of income this past year, so hopefully for 2019 I can prioritize on building a more feasible income stream from my course that can steadily grow over time. Regardless of new enrollments, many of my students that I helped have experienced great success with their blogs using all the tips and tricks I teach in The Blogger Bible, which I also attribute my own income and growth. One of my students Thuy at Thuy’s Avenue recently landed a partnership with her local LOFT store with only 3,000+ followers on her Instagram. She’s spent the past year developing a gorgeous Instagram aesthetic, honing her business partnership strategies and creating a very clean and professional blog, and the hard work is paying off! She’s had tremendous creative growth and I’m so excited to see where 2019 takes her. Another Blogger Bible student Wynn at Wander X Luxe has been hyper-focused on building her luxury fashion, beauty and lifestyle blog: on her launch day, she got over 1,500+ page views and also grew her Instagram to over 10,000 followers in less than 4 months using strategies in my Pinterest and Instagram chapters from The Blogger Bible. This past year, some of her biggest sponsored clients include Nike, Long’s Jewelers, and Childish Gambino (!). While there are many blogging courses available online, there are none that are specifically geared towards the fashion, beauty and lifestyle niches nor include in-depth strategies for Instagram influencer marketing. In this course, you’ll not only learn how to develop a stylish aesthetic but will also create an achievable long-term business plan and learn various ways of monetizing both your blog and social media platforms. Click here to learn more about The Blogger Bible. I’m almost kicking myself for having spent far too much time stressing out about Instagram. I admit that I was very much enchanted by its vanity, taking beautiful photos and trying to validate my self-esteem on this platform. I mean, it is a powerful platform, but I feel like what I want to write more about is budgeting and affordable products, and I just don’t think those things perform as well on Instagram – especially with people between the ages of 20-35 (my main audience demographic). Because of that, I spent more time posting more outfit photos and selfies (which wound up performing better), but I feel that I could have spent that time growing my affiliate income and site traffic instead. Another thing I could have done better was to employ a better sponsorship strategy. Although I landed many sponsorships through Instagram, many of them were unpaid during the first half of the year. If I had focused more on sponsored blog posts (which pay more and also have the potential to earn more through affiliate links), I am almost certain I could have made more money this year. In fact, I’m sure if I’d negotiated for a higher rate on a few sponsored posts I would have definitely been able to hit my $40,000/year mark, or at the least earn $6,000 in December (technically I earned $6,000 but I was waiting on a payment, so I can’t exactly count that. Boo.). I’ll admit: the perfectionist and over-achiever in me definitely had high hopes for this year. My goal was to earn $50,000, and I was a bit disappointed that I even fell short of $40,000 – I was just $2,000 shy! 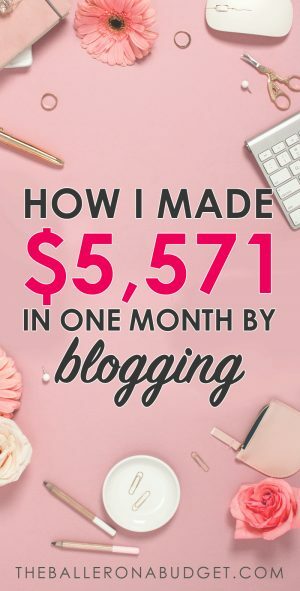 I confess that when I research strategies to grow my blog and income I still find myself comparing myself to other bloggers that are making my year’s worth of income in a single month. But as a reminder to myself (and my readers! ), I need to remember that everyone’s growth in blogging varies widely due to niche, strategies used, time and efforts spent, and much more. Still, I am counting my blessings and the fact that I was able to grow my income from a mere $72 in 2016 up to nearly $40,000 within just 2 years. And ending the year with almost $5,500 in monthly income definitely made me happy, so I’m excited to see how my monthly earnings will grow in 2019! In 2018 I witnessed amazing growth in my income. In January 2018 I earned $2,141.07 and in December I made $5,270.35, which is a 146% increase in monthly income. Although the growth was not necessarily compounded each month, the beginning and the end of the year still shows there was tremendous growth. Compared to 2017 I made a total of $10,727.91 and then jumped to a total of $37,953.17 in 2018 – an increase of about 254%. Now, this is probably being ambitious, but if I could possibly maintain growing my income at that same rate of 254%, that means I could potentially earn roughly $94,401 for the year of 2019. Of course, this would be impossible to calculate since my income varies greatly month-to-month, but there is still hope for some sort of growth, fast or slow. For this year, I’m going to focus less on both creating content for my social media and growing my followers (Instagram, I’m looking at you). In 2018 I dedicated probably 70% of my efforts to Instagram, but with all of the algorithm changes being made (and even more to follow) I feel like it’s a reasonable choice to put more of my energy back into my blog. I really want to grow more passive income, and I think that will be achievable by building my site traffic to drive up both ad revenue and affiliate sales. Additionally, while I don’t intend on increasing the volume of sponsored campaigns I take on, I do plan on raising my sponsored rates. I think it’s wise to start charging more as your site traffic and social media followers grow so that you can narrow down sponsored partnerships to reputable ones only, do less work, but put out higher quality work, and get paid more in-turn. What did your 2018 look like? Are you thinking of starting your own blog for 2019? 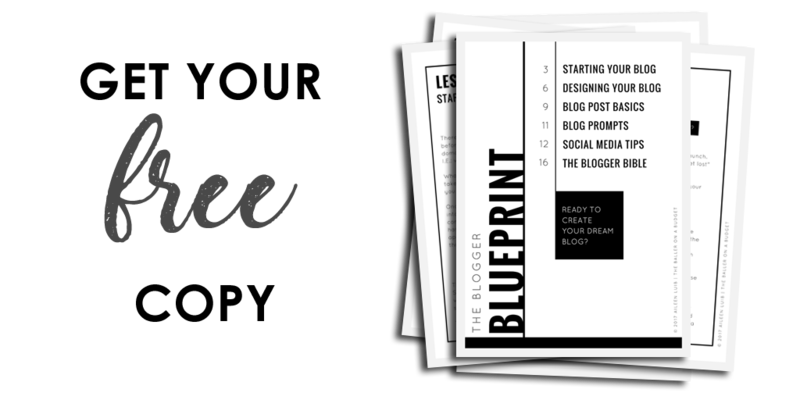 Download your free copy of THE BLOGGER BLUEPRINT to learn how to design and create a blog from scratch. You’ll also learn how to publish amazing blog posts that generate tons of traffic and build your audience across several social media platforms with! Previous Post Kitchen DIY Renovation Pt. 1: Cabinet Makeover – Cheaper Than New Custom Cabinets? Thanks for sharing this Aileen! Love how in depth you went with the post and how you shared your goals/plans for 2019. I’m sure you’ll have a great year, the growth you’ve already achieved is fantastic! I’m glad you found this post insightful, Charlie! Thanks for reading. Eileen! I love, love, LOOOOVE this post. Thank you for being so transparent about your blogging journey. To experience that kind of growth in two very short years is AMAZING mama, and I’m proud of you and super inspired by you. I’ve been studying up on jumping into the online / blogging space for many years (since the birth of m y baby #2 in 2016) and am only NOW starting to put myself out there, but I am a big believer in this being an opportunity to cut me from my full time corporate life so I can focus fully on being flexible for my 3 babies. Thank you again for this. As soon as I can get the budget back on track from the holiday recovery, I will plan on enrolling in your Blogging Bible Course. I have a feeling you’re gonna hit that $90k+ goal. Love your journey; I have the same story, so it’s a gift to have you share yours and makes me feel more confident about putting myself out there. Cheers mama! Ugh. I’m so sorry. TOTALLY mis-typed your name b/c I had my property manager’s name (Eileen) on my mind as my next note to send. So sorry Aileen!!! Thank you for all the kind words, Ana, and no worries on misspelling my name 😛 Thank you for also sharing your story – I feel like many of us who enter the blogosphere also share similar desires to free ourselves from corporate life and regain control of our time. How nice would it be to use that time towards your family and your own business? I sure hope this post inspired you to take that leap of faith – it was the best thing I ever did for myself! Hey Aileen! Congrats on such an amazing year. We’re so glad to have you as a part of Mediavine, and thanks so much for the shoutout in your awesome post. We’re looking forward to a stellar 2019 with you! Thanks for sharing your experience! This is really insightful. You have worked so hard and it shows. Congrats! Massive congratulations on your blog growth and thanks for sharing all this information! So interesting and helpful! Glad it was able to inspire you, Hannah! Congrats in your blog growth. I would be very curious to know how much you charge now for sponsored post. I agree your rate seemed really low. Hi Sophia, thank you! My sponsored rate depends on a variety of factors such as platform (ie. blog vs. Instagram), content required (a simple photo vs. several photos + a blog post with a minimum of 500 words) and the nature of the content, however I’m currently charging anywhere between $500 – $1500 per sponsored project at this moment in time. Hey, thanks for this post! I am in year two and still not seeing a huge income but I have been inconsistent and I see that it’s probably a huge factor. Anyway congrats on all the growth and thanks for sharing! Hello! Great post! I am in a non-fashion (food) niche, but struggling to find stable traffic from search engines. May I ask, what do you do for SEO?